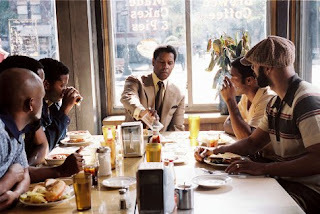 Whopper's Bunker: American Gangster: Take a good snort! I saw what sometimes looked like a Martin Scorcese movie this weekend, which is weird only because it was directed by Ridley Scott. I could tell you that it was a masterpiece, an instant classic: but I'd be in error. It wasn't. Was it good? Yes. Had it been a Scorcese movie, it would have been somewhat sub-par like Casino, but it was a Ridley Scott movie who has normally been a hit (Black Hawk Down, Gladiator, G.I.Jane, Black Rain, Blade Runner) or miss (Matchstick Men, Hannibal, Alien, White Squall) director. But this is his first middle-of-the-road movie for me, the first time I'll debate if a Ridley Scott movie is to become part of the war-winning Creedon Collection. I'm going to start with the negative this time and build it up to it's final rating. What I didn't like about this was that there was nothing supremely original about this whatsoever. We've all seen Afro-American "bad-dudes" in movies, disturbingly graphic scenes of drug abuse, corrupt cops, boyscout cops and even Armand Assante as a bad guy. Scott seemed to draw certain essences from the likes of Scorsese, DePalma and Copolla to craft a thick rick soup but it came up a weaker broth than it could have been with those ingredients, something went wrong ever so slightly and robbed what should have been something from the 21st century to stand among classics like Scarface, Goodfellas, The Godfather. While quite a long movie, it's a tribute to Scott's talent that there was hardly a dull scenes throughout. I never worry about Denzel Washington in the acting department, he'll never let us down. I think that in a few scenes he was able to switch from Pacino to Pesci with relative ease but his character was expertly crafted as someone who succeeded because he didn't draw attention to himself. 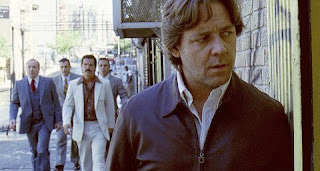 Crowe had a harder part in not straying too far from Lumet's Serpico but yet bringing depth to Richie Roberts a Cop charged with taking down the drug-lords, learing to be a lawyer and divorcing his wife all without too much support because of course no one likes a boyscout cop. It's still difficult to day which one of them is going for the Oscar, but if you can't tell, maybe that's good yes? Final Verdict: It's shocking to think even some of this is true. Scott expertly melds the spirit of the classic Drugs/Cops/Mafia movies into a quality tale that will keep you entertained, but it could have been more than the sum of it's parts. Nice review! I thought the film was a very competent attempt, but it ultimately proved slow and didn't really go anywhere. For something so heavily indebted to rather wistful sense of Americana, I was also surprised how unmoved I was by it all. On a similar note, I noticed there's a film opening this week in London called Cocaine Cowboys. Purports to be the real life tale of the inspiration behind characters in Miami Vice and Scarface. Lots of coke-themed movies out at the moment then! Website at www.cocainecowboys.co.uk, and showing in Odeon Panton st from friday. Know anything about this doc? Looks pretty good. No Documentaries always seem to me to be more a voice for some misguided-liberal to make a statement about what the world means to him. I understand Scarface but I am however quite disturbed that Miami Vice is in some way based on fact! I read an interview with Denzel where he talked about getting freaked out while talking with the real Frank Lucas, who even as a 'defanged' enrollee in the witness protection program STILL radiates his '70's 'gangsta' menace. Always tough to play that type of character. What's the old saying about gazing into the abyss? Or about 'those who hunt monsters'? Actually Creedon you may go to Cocaine Cowboys it features real televised shootouts from the Eighties and charts the Rise and Fall of the Miami Drug Barons of that inspired Scarface and Miami Vice, it's gotten very good reviews and they are already shooting a sequel dealing with the most murderous drug baron who was a woman , named her son after Michael Coreleone and her Nickname was the "Godmother" and that was what the Police called her.